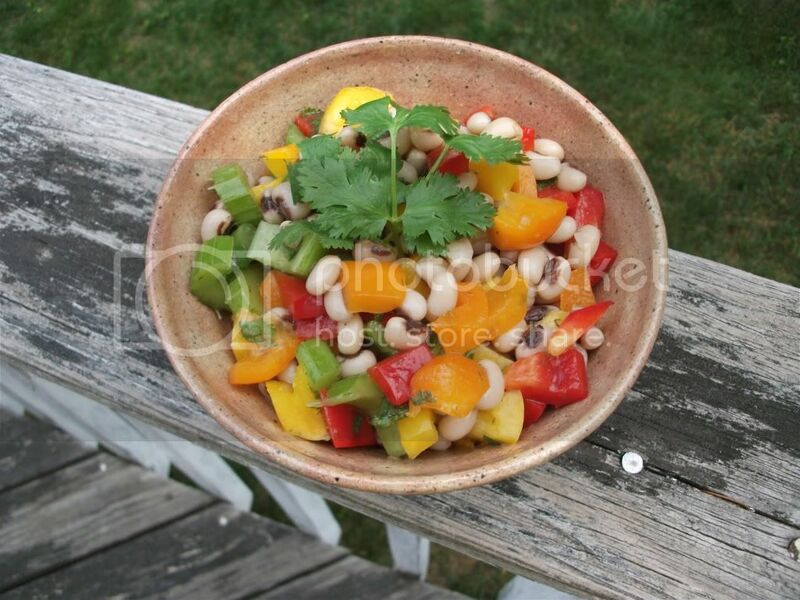 Continuing with dishes that are perfect to take to summer potlucks and BBQs, let me present this vibrant bean salad. It's crunchy and colorful with a bit of a kick. You can serve it as a side dish, or I've also been putting it over a bed of baby spinach for a delicious and healthy lunch. The recipe is loosely based on a dish my aunt makes for the annual New Year's Eve party. Apparently, eating black-eyed peas at midnight will bring you luck and prosperity for the next year. Still, I think black-eyed peas are tasty no matter the season. And, who doesn't need a little extra luck year round? Wash the black-eyed peas, and allow them to soak for 6 to 8 hours. Drain and rinse the soaked black-eyed peas. In a large pot bring eight cups of water to a boil. Add the black-eyed peas, reduce heat and simmer for an hour. Remove from heat, drain, and rinse the black-eyed peas in cold water. Wash the bell peppers and celery, and dice them into pieces about the size of a bean. In a large bowl mix the black-eyed peas, diced bell peppers, and diced celery together. In a leak-proof container (I use an old Mason jar), combine the extra virgin olive oil, apple cider vinegar, raw agave nectar, chopped cilantro, sea salt, dill, and fresh ground pepper. Close tightly, and shake vigorously for several minutes to make the dressing. Evenly pour the mixture over the salad, and stir to thoroughly coat.